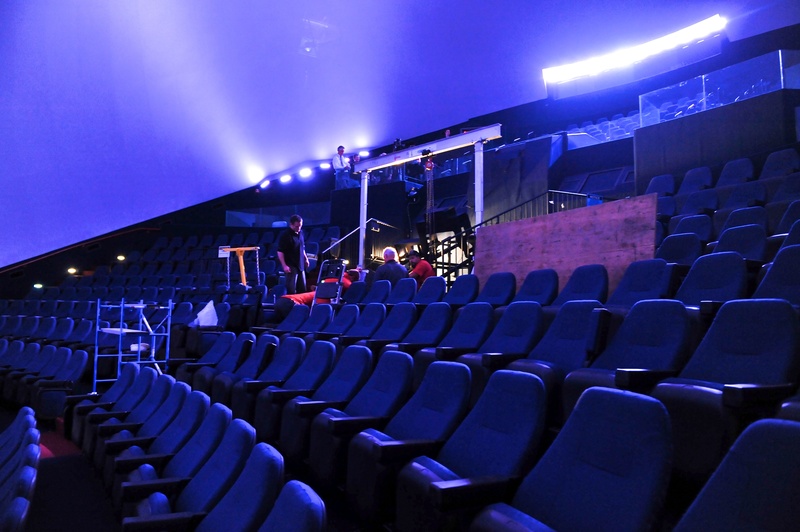 The Reuben H. Fleet Science Center’s “The Sky Tonight” live monthly planetarium show features a new, seamless Heikoff Dome. The new dome was also open in time to screen their latest feature, “Black Holes: The Other Side of Infinity,” which is currently airing. The Science Center continues to offer educational sky-based experiences but now has the flexibility to extend programming to a wider range of formats and subject matters because of the new dome. The Heikoff Dome, which is 76 feet in diameter, provides a 168-degree vertical view by 360-degree horizontal view experience. The theater holds 314 seats. Fleet’s executive director Dr. Jeffrey Kirsch led the $5 million project with supporting efforts by Tei Iki, William Bleha, Robert Hardacker, Jack Schmidt and Dave Eccles. Heikoff Dome volunteer technical advisors included Bleha, Hardacker, Schmidt and Eccles. Major donors for the Heikoff Dome are Joan and Irwin Jacobs; the Weingart-Price Fund; Don and Maryann Lyle; Patricia Carter; Joseph Cohen and Martha Farish; the Hervey Family Fund; the Nierman Family Fund; Audrey S. Geisel and the Dr. Seuss Fund; the Helen K. and James S. Copley Foundation; Chuck and Judy Wheatley; Margie Warner and John H. Warner Jr.; Eric and Peggy Johnson; and Nancy Robertson and Mark Cookingham. Balboa Park’s 2015 Centennial planners intend to make science, technology, engineering, art and math their major themes. Paige Simpson, interim executive director of the Balboa Park Cultural Partnership, said they intend to have technology companies and institutions team up with arts groups. The Partnership represents 26 park institutions. There is also discussion of a 21st century Children’s Zoo to replace the current, 1950s-era space at the San Diego Zoo; special sports tournaments at Morley Field; and a Burning Man-type art fair on the Southeast side of the park. These ideas have been presented at public workshops at the House of Hospitality in Balboa Park. Ben Clay, co-chairperson of the 2015 Balboa Park Centennial Celebration organizing committee, said he is meeting with non-park institutions, organizations and leaders to collect more ideas for the celebration.